The next Taizé prayer at Church On The Corner is to be confirmed. Email taizeonthecorner@gmail.com for information. We meet in the Chapel upstairs at Church on the Corner. Map here. After a year of meeting monthly on a Tuesday at 8.30pm, we want to check that there is not a time that more people can meet together. If you want to let us know when you would find it easiest to join us please use our survey: http://www.surveymonkey.com/s/N2SKFRZ . Thanks! Next Taizé prayer at Church On The Corner: Tuesday 9th August at 8.30pm. Next Taizé prayer at Church On The Corner: Tuesday 12 July at 8.30 pm. Next Taizé prayer at Church On The Corner: Tuesday 21 June at 8.30 pm. Next Taizé prayer at Church On The Corner: Tuesday 24 May at 8.30 pm. Text Taizé prayer at Church On The Corner: Tuesday 24 May at 8.30 pm. We are meeting for around an hour every month on a Tuesday evening. To be updated about future appointments, please email taizeonthecorner@gmail.com . Also, a group of us is going to Taizé from 24 to 31 July. We are going by train but it is also possible to go by coach from Victoria (a bit cheaper). Please email taizeonthecorner@gmail.com if you want to join us or receive further information. A group from Church On The Corner is going to Taizé from 24 to 31 July. We are going by train (around £100 return) but it is also possible to go by coach from Victoria (a bit more expensive). 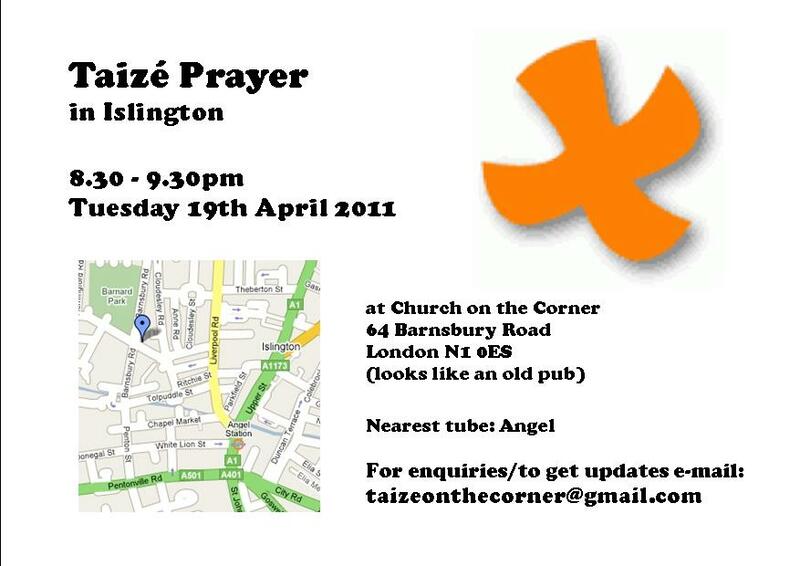 Next Taizé prayer at Church On The Corner: Tuesday 19 April at 8.30 pm.